Maybe you have seen Jerusalem Artichokes in the market but didn’t know what to do with them. Confusion comes easy here. They have nothing to do with Jerusalem and they are not related to artichokes. Some greengrocers have taken to calling them Sunchokes. Italian immigrants in the USA called the plant girasole (meaning: turning toward the sun) because it looked like the sunflower, and girasole got corrupted to Jerusalem. You can make a nice creamy soup with Jerusalem artichokes and when you serve this to guests, sit back and take the compliments they are sure to issue. Ladle soup into bowls and place pine nuts atop. Serve this Jerusalam artichoke soup (or Sunchoke soup if you prefer) now and brace yourself for the imminent praise, maybe even from as far away as Jerusalem. Do you know, I have never cooked Jerusalem Artichokes. I am going to have to try this and see how it tastes. MY JOURNEY WITH CANDIDA: They are like swiss chard, a lot of people just pass them by. If you can eat this vegetable I hope you will. This soup tastes good. you always know how to make me hungry! NUTSCHELL: Thank You, as always you are very kind. 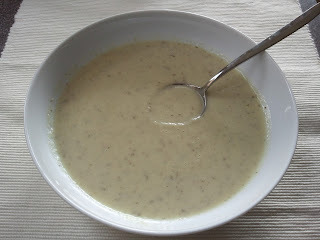 LYNN PROCTOR: Thank You Lynn, this soup should be more popular. the soup looks real good, though. This sounds and looks really wonderful. I am going to have to put this on my menu soon. Thanks! AL PENWASSER: Yes, that is an artichoke. This soup is made with a different vegetable that is called a "Jerusalem Artichoke" or a Sunchoke. It is totally different from that vegetable that you don't care for, and in fact I don't care too much for, called artichokes, which are different from jerusalem artichokes or sunchokes. Just remember Jerusalem, when coupled with artichokes is not - artichokes. LADYDRAGONFLY: Thank you. You will be glad you did when you do. TORVIEWTORONTO: Thank you, it is a delicious soup. I should try this. I'm trying to visit all the A-Z Challenge Blogs this month. While I love my various soups, I am a scared y-cat when it comes to vegetables. I wouldn't know an artichoke from an asparagus sandwich if it weren't for the bread. The weather is starting to get chilly here in Oz so these soup recipes are fab!! SHARKBYTES: Thank You for visiting. When you get off the trail please consider this soup. JEREMY BATES: Vegetables can be scary if your relationship to them has been scarred by badly over-boiled or cooked to death vegetables with little or no seasoning. LYNDA R YOUNG: I hope you will try some of these soups. KATE O'MARA: Technically these are not artichokes but a different vegetable altogether albeit delicious.